As a freelancer all of my income comes from client work. So it might be somewhat unorthodox to send away a would-be client. Today I had a call from the owner of a website looking for someone who could do updates to her site on a regular basis. I can sympathize with a non-geek that the idea of updating something so code-based could be unthinkable or intimidating. Rather than quoting on a maintenance contract I explained how tools like Adobe Contribute allow a relatively web-illiterate person to maintain their own sites! While it doesn’t really grow my business at all, I hope it shows that I’m more interested in the clients ideal work-flow processes. It’s ironic, to do the best for the client I couldn’t make them my client… I got talking with this woman and learned that in the process of quote gathering other agencies were propsosing that she do an entire site redesign! While any site has room for improvement, this was definetly a needless upsell. Here’s a lovely picture from a friends first day playing guitar hero. 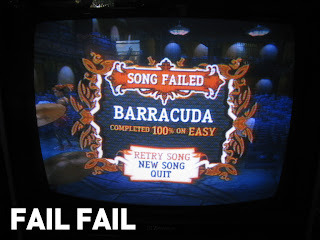 Somehow she missed the last note when in the red, failing at 100%. Neat!